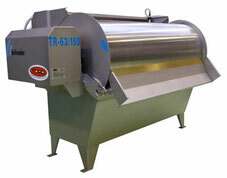 Rotary sieves - Ecokube sp. z o.o. Rotary sieves are used to remove solids from 0,15 to 2 mm size from sewage. These devices are highly efficient and maintenance free. We offer machines with flows from 7 to 3 280 m3/h. The main element of a rotary sieve is the cavity drum made of stainless steel AISI 316 L. Sewage is pumped through the inlet gully. Water flows through the gaps into the drum, while solids remain on it and are later removed through the chute. Inside the drum there are brushes that clean the sieve and throw away the sludge, therefore the device is self-cleaning. Static sieves are used to filter or sieve solids – separate them from liquids. In municipal wastewater treatment plants pieces between 1 and 1,5 mm are removed, whereas the range for industrial wastewater is about 0,5 to 1 mm. The flow in our devices stands between 30 and 280 m3/h. The sieve is built of laminate headbox, slotted sieve made of stainless steel AISI 316 L and a container in which filtered liquids are stored. Pollution gets into the headbox, then to the sieve, where solids are separated from liquids. Left pieces slide down the surface of the sieve while the filtered liquid is drained outside through pipes. Vertical sieves mechanically separate solids from industrial and municipal wastewater. 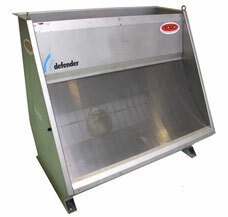 This sieve is widely used in small industries, where there is no space for larger installations. Compact construction makes this machine perfect to montage in buildings located in open areas, such as sewage pumping stations, drainage stations or sewage sumps. Wastewater is transported to the intake chamber that is integrated with the device. There sewage is depressurized and the flow becomes slower. The intake chamber can also be used in emergencies such as too fast sewage income or lack of power. From the income chamber, substances are moved to a cylindrical straining basket, were solids are separated. Screenings that stopped inside the separating element are removed by brushes. Pollution is transported upwards with the screw conveyor and then thrown out of the device. During transport, screenings undergo dehydration and mass reduction. 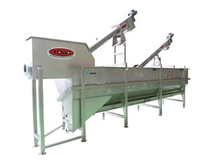 Sand removers separate and dehydrate sand, gravel and mineral suspensions from sewage. With sand’s grain from 0,15 to 0,20 mm the separation amounts to 97%. Sand remover consists of separation chamber made of stainless steel or fiberglass with polyester (PRFV) and a shaft screw that enables transport of the sand. 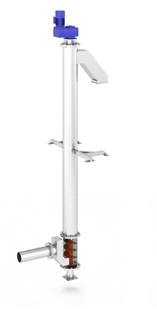 Upper parts have stainless, easy to open covers, so that the drainage is easy to control. The drive is located in the upper parts of the trough to avoid sealing problems. Our devices have the flow from 15 to 150 m3/h. 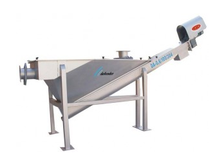 This device brings together functions of rotary sieve in a container integrated with screening press and horizontal sand remover integrated with sand separator. In addition it rinses and dehydrates screenings and separates flowing pollution from industrial and municipal sewage. It is used mostly in wastewater treatment plants and food industry. At the beginning, sewage gets into rotary sieve, where solids (screenings) are separated. Then sewage undergoes sedimentation in the sand remover. Sand sinks to the bottom where it is transported upstream with a shaft screw. Finally the sand gets into the collection chamber and from there is transported outside with a shaft screw. Treated sewage goes into the exhaust pipe.